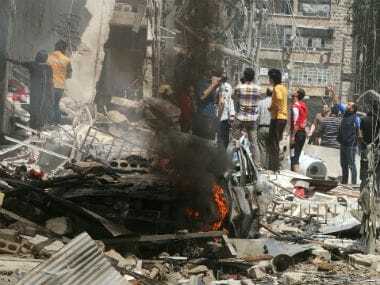 Beirut: At least 22 civilians have been killed in 48 hours of heavy air strikes by Syria's regime and its ally Russia in northwestern Syria, a monitor said on Thursday. The strikes hit areas in the provinces of Idlib and Hama, where an internationally agreed truce zone is meant to be in place, and come in response to an offensive launched Tuesday by jihadists. The agreement has brought relative calm to the regions involved, but the Syrian Observatory for Human Rights has reported dozens of raids on Hama and Idlib since Tuesday, when jihadists began attacking government positions. Jihadist factions led by a former Al-Qaeda affiliate, which are not included in the de-escalation deal, launched a fierce assault on Tuesday on a string of government-held villages along the border between Idlib and Hama. Russia has already deployed military police to the other three safe zones - Eastern Ghouta near Damascus, parts of the south and some areas of the central province of Homs. The de-escalation agreement excludes the jihadists of the Islamic State group and Hayat Tahrir al-Sham, an alliance dominated by Al-Qaeda's former Syrian affiliate. More than 3,30,000 people have been killed in Syria since the conflict began with anti-government protests in March 2011.